Hello there Witchy Words readers! My name is Emily, and I am a friend of Marietta's as well as a Guest Member in Circle of Fountains! I work as a baker, doing mostly desserts, at a health food store and I have been studying and/or practicing witchcraft for the past 15 years. While I have always considered myself Pagan, I never really started defining what kind of witch I am until recently. I really started to get interested in kitchen witchcraft when I got into culinary school. I still don’t think I am anywhere near an expert as I still have to look up a lot of herbal info (though in my defense, there is an endless amount of that out there). However, I can definitely work some magic into my food, as can you! One of the things with kitchen witchery is that it is more than just herbs. There is energy in everything, so all your food will have different associations and energies implicit to them, and your job is to determine what foods are lending what energies, how to bring forth those energies, and to decide if that particular ingredient can actually work with what you are making, regardless of the energy or association it has. For instance, both coconut and mustard seed can be used for fertility, but you may not want to add mustard seed to your macaroons. The other side of this is that not every ingredient in a recipe has to have associations and energies for the spell you are doing. Sometimes, things need to be there to make the flavor work, or the cake rise, or the sauce thicken, whatever it is, it does not require the exact energy of every single ingredient. Just do your research, and make small adjustments to recipes if you need to. Food is pretty flexible, so make something you love and make it work. I do have a couple of books you might look into if you want to find out what kind of magical correspondences your food had. The first one is Mrs. B’s Guide to Household Witchery by Kris Bradley. She talks a lot about making things work with kids, and making the mundane sacred, which is pretty useful. there are also some section on magical sweeps, simmering incense, washes, oils, household deities, and most important, food correspondences! Now, this is by no means a fully comprehensive list, but it is still a pretty good one. Another one I like is The Magic in Food by Scott Cunningham. He is a well known and prolific pagan writer known for his good information. Sometimes his information clashes with the other books I have. When that happens, I go with my gut and what will work for what I am doing. I am sure there is tons more information out there, so if you have a good one, please share! 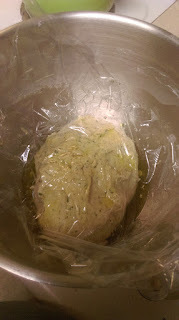 So what I am covering for you today is probably one of the easiest things to work some energy into, bread. Now it may seem like something that is difficult to do, but the fact that you work it with your hands at least a little bit gives the opportunity to really push some of the energy for the spell you are wanting to do into that bread. 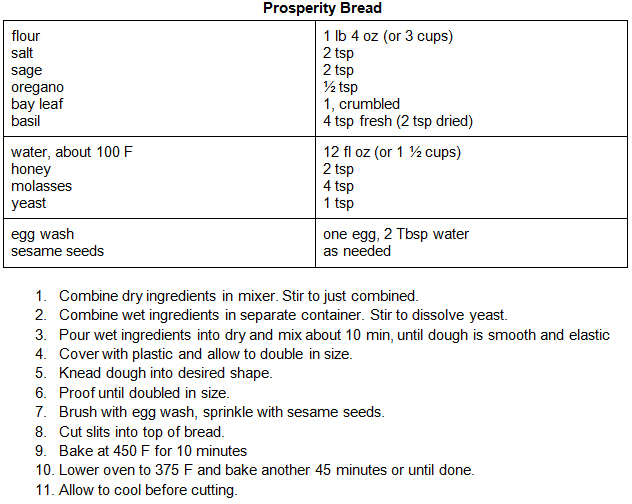 Prosperity is something we can all use, and works pretty well with ingredients that are already in bread, so prosperity bread it is! Let’s start with the ingredients and their magical associations. 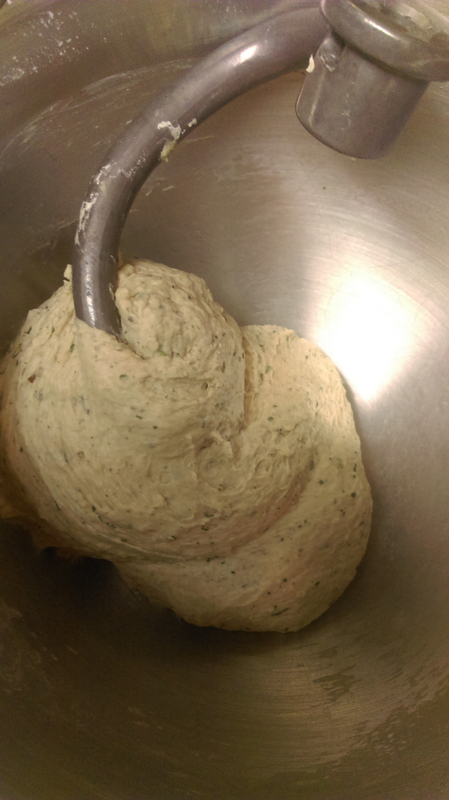 First, there are the normal bread ingredients, then the flavors we added. sage (culinary) - anxiety management, business success, cleansing, healing, house blessings, hunting, money draw, prosperity, protection, purification, wisdom. basil - banishing, business success, creativity, exorcism, fertility, fidelity, handfasting or marriage blessing, house blessing, love, love divination, joy, luck, money draw, passion, prosperity, protection, protection during travel, soothes anger. sesame seeds - fertility, justice, lust, nightmare prevention, prosperity for the household, road opener, truth. bread - (it’s in my book, might as well right!) fertility, giving thanks, prosperity, protection. Now, we definitely got lucky here in that pretty much everything in the recipe, including the final product, all have associations with prosperity. Part of this is that it is the nature of bread that it grows and rises, and you want to prosper and grow and rise in the same way. I use a kitchenaid mixer for my bread, so that is what I will suggest. If you do it by hand, it will take longer, be messier, but get lots more of your energy and personal touch. This is up to you and the resources you have, but I will be going over this referencing the mixer. 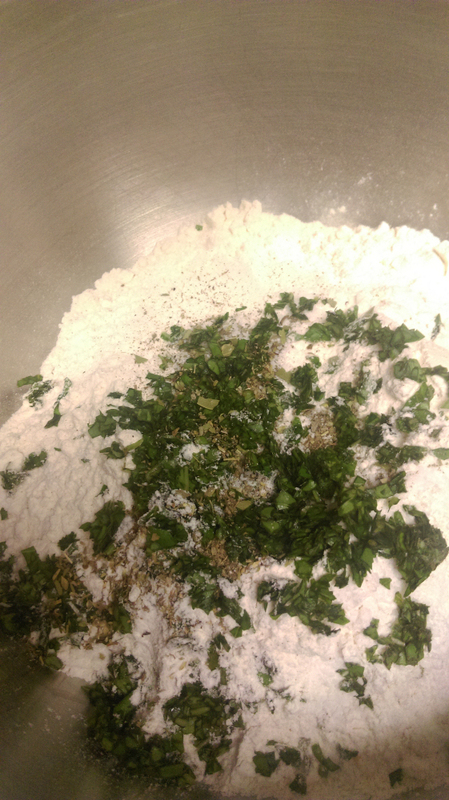 To start, put about 3 cups of flour, 2 teaspoons of salt, 2 teaspoons of sage, ½ teaspoon of oregano, 1 bay leaf, crumbled into small pieces, and about 4 teaspoons of fresh basil (if you use dried, knock that down to 2 or 3) chopped fine, into the mixer and mix it until just combined with the dough hook while you gather your other ingredients. In another bowl, combine 2 teaspoons honey, 4 teaspoons molasses, 1 ½ cups warm water. This should be about 100 F, or close to body temperature. If you have a thermometer, check it. If it is warmer than 110 F, cool it just slightly as hotter than this will kill your yeast. Add 1 teaspoon yeast to the water, honey, and molasses and stir to dissolve the yeast. Pour this into your mixer and mix with the dough hook. This should go for about 10 or so minutes or until dough is smooth and elastic and no longer sticks to the sides of the mixer. 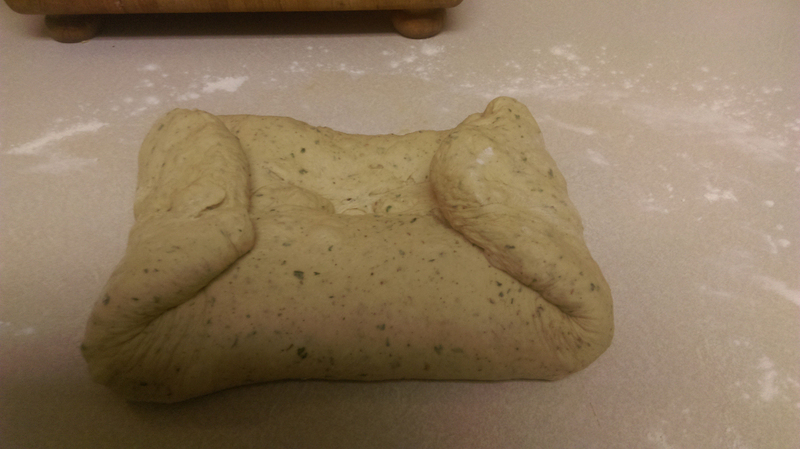 In fact, it will be pretty well collected on the dough hook, but come off easily. Mixing this long helps build the structure that will keep your bread airy and light (this is the gluten you are building). At this point, you take the bowl off the mixer, take out the hook, and cover the bowl with plastic wrap. 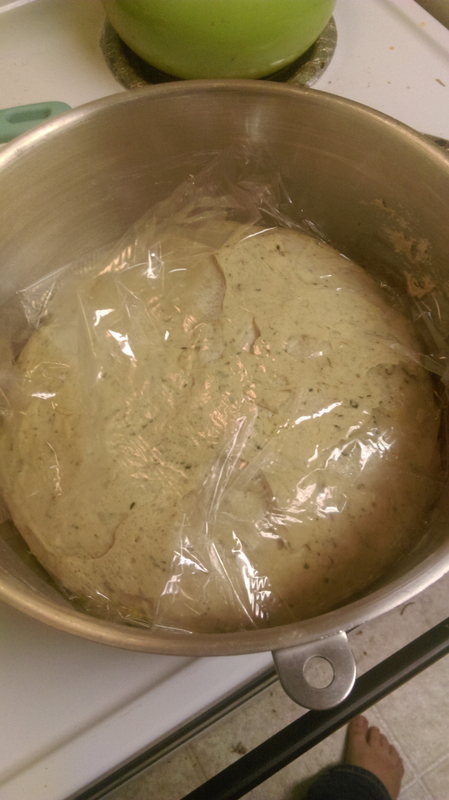 Let the dough rise until it has doubled in size. Sometimes this takes a little bit as it really depends on the air in your kitchen. Warmer means it rises faster, but a slower rise develops more flavor. You want an in between. This is a good time to start cleanup usually. Once your bread has doubled in size, flour a bit of the countertop in your kitchen, just a light dusting, not a whole lot, take the bread out and knead it just a little bit. 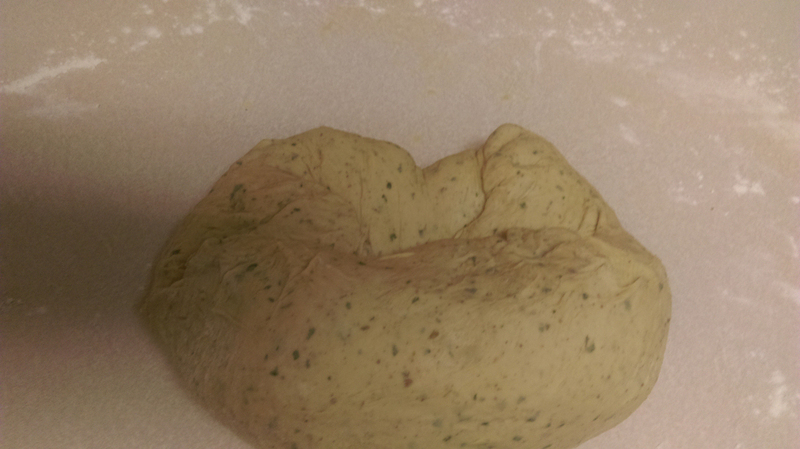 When you do this, you take the outside of the dough and push it towards the center with the heel of your hand. 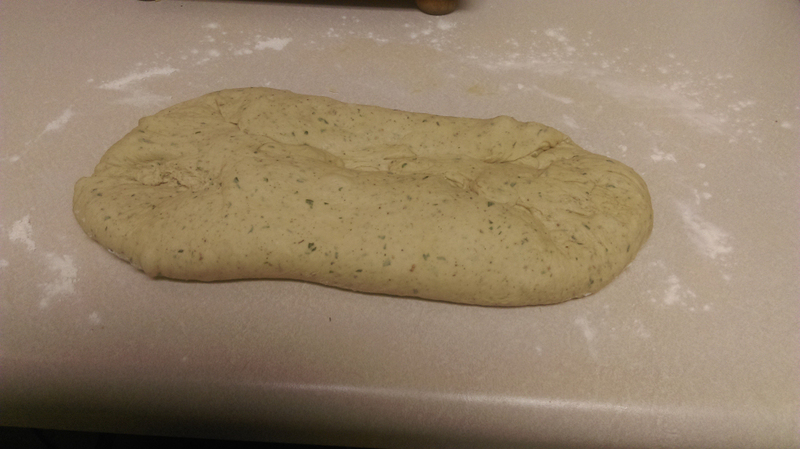 Do this a few times, and then begin to shape your dough. You can make it round if you like or a few small rolls. Put it in a loaf pan if you want. I tend to go for a free-form loaf. 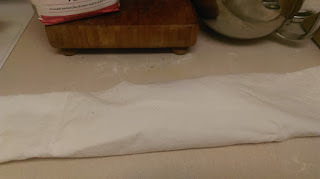 I begin to roll the dough, then about halfway up, pull out a each side a little and push it in towards the center, then continue rolling. Once you have your shape, you need to let it proof. No matter the shape, I suggest covering it with a cotton towel. To enhance the shape I like, I roll mine up in a towel I have floured, not extra tight, but not too loose so it will grow in length, instead of out. Again, you let it double in size. 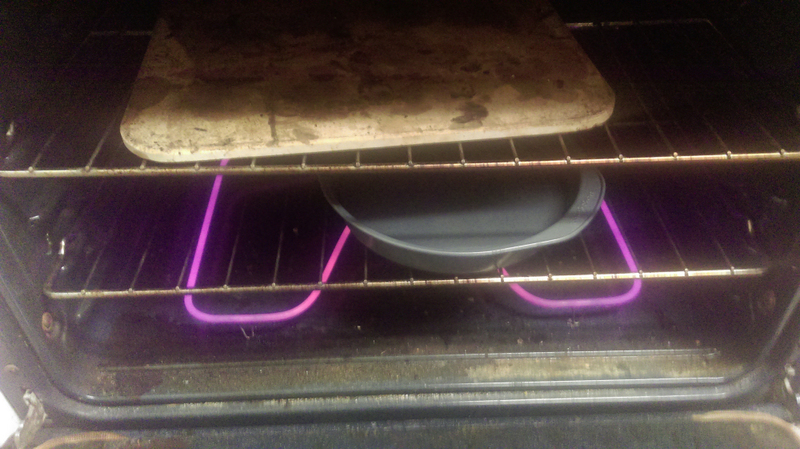 This is a good point to get the oven pre-heated to 450 F. You can also go ahead and put a pan of water in the oven as your bread will need moisture when it bakes. 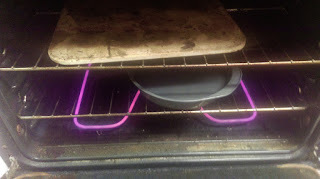 Please please PLEASE, do not use a glass or pyrex pan, and later put cold water in it. The pan will shatter, and it will be a literal hot mess to clean up. I speak from experience. Once it has doubled in size, you need to score the top. I do diagonal lines on mine, for a loaf pan you can do a line straight down the middle, for a round loaf you can do a cross in the middle. If you’re bread is not already in a pan, sprinkle a little cornmeal on a baking sheet to prevent sticking, and put your loaf on there. If you have a pizza stone, you can push your bread onto that from the back of the baking sheet, if you don’t, just leave it on the sheet. 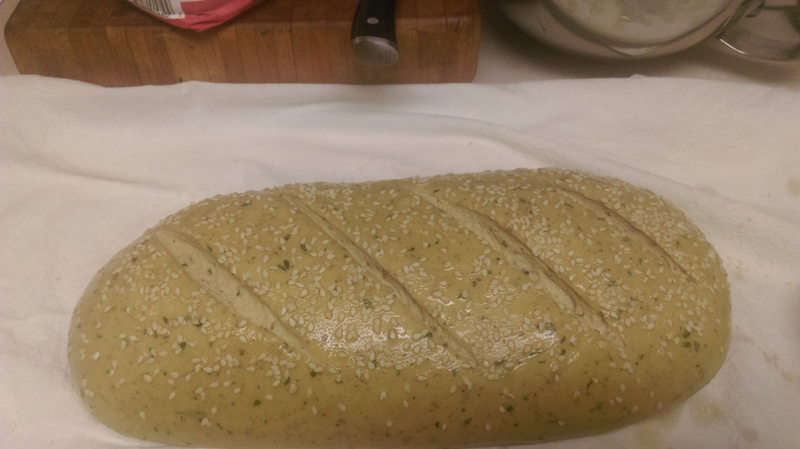 This is the point where I brushed mine with olive oil and sprinkled the sesame seeds on top. Unfortunately, as I should have known, the sesame seeds did NOT stick to the bread after it was baked. They all brushed off immediately. So, if you desire sesame seeds on your bread and want them to stick, brush it with egg wash. That would have worked better. 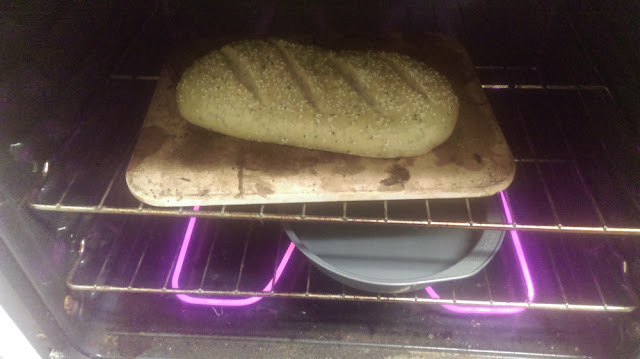 Put your bread in the oven (you may have to add water to your pan), and bake at 450 F for about 10 minutes. At this point, turn the oven down to 375 F and bake another 45 or 50 minutes. Be careful pulling your bread out of the oven. If you are not using a loaf pan, a knock on the bottom of the bread should sound kind of hollow so you know it’s done. Allow it to cool before cutting or tearing into it, and enjoy!! This would be particularly good dipped in a dish with a little olive oil, salt, and pepper. Maybe add some Parmesan cheese if you want. Or, you can just use butter, however you like it! Just be sure to focus on the prosperity you are bringing into your life as you eat the bread you put all that prosperity energy into, and thank your Gods, or Universe, or whatever, and leave them a little bit as an offering. They usually like that. 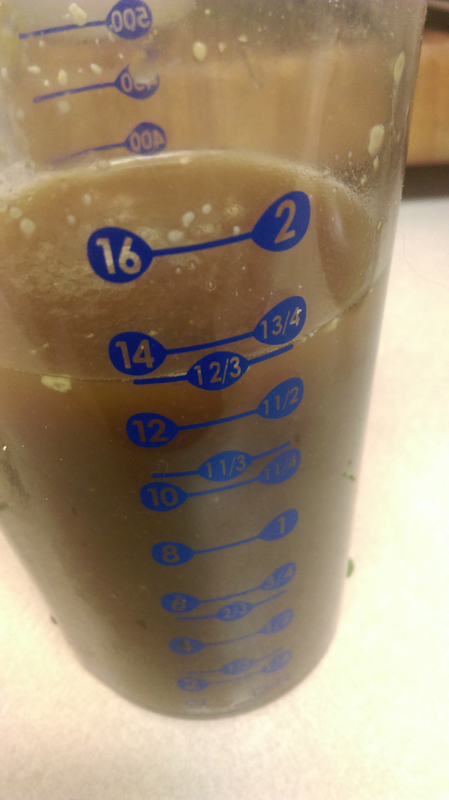 While this is for prosperity, you can easily change up the herbs for other things. 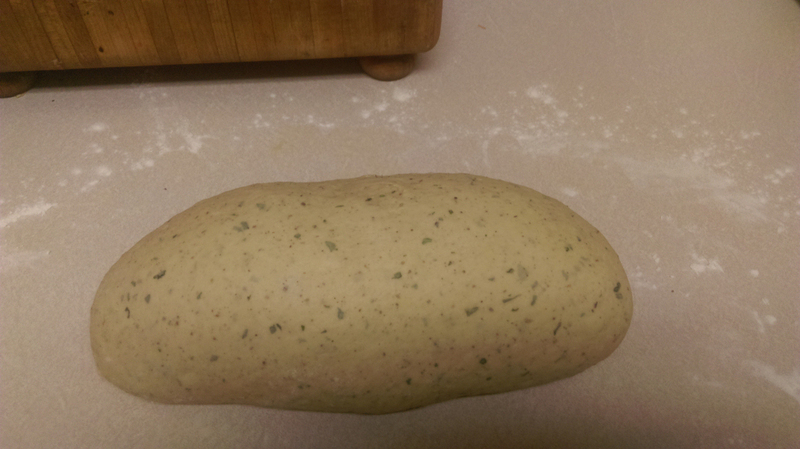 For instance, some rosemary and black pepper is fantastic for protection, and also really delicious in bread. Feel free to play with the combinations of herbs to get something you like (this is heavy on basil because I love it and it was fresh from my garden) or, if you don’t want herbs in your bread, leave them out. 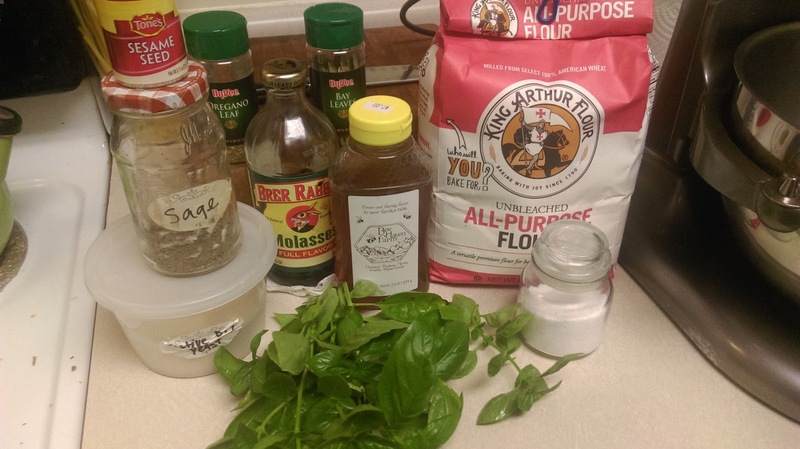 The basic bread recipe I use is the flour, water, yeast, salt, honey and molasses. Beyond that, experiment and play and have fun! As the baker for Kansas City's Green Acres Market and a pagan for over 15 years, Emily (despite what she might think) is an experienced kitchen witch. She has been a guest member with Circle of Fountains for over a year and is a member of a local Kansas City coven. 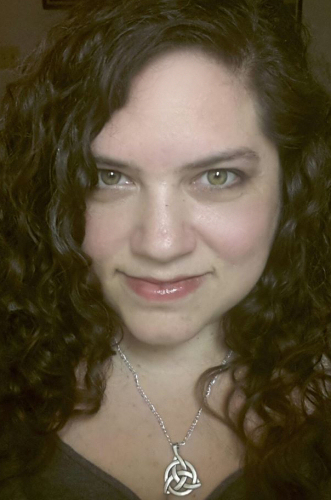 When not working or with her covenmates, Emily is actively involved in the Kansas City pagan community and co-hosts the Liberty Coffee Coven once a month. I've been making bread for a few years, but yours is gorgeous. I like the tip on using the towel.